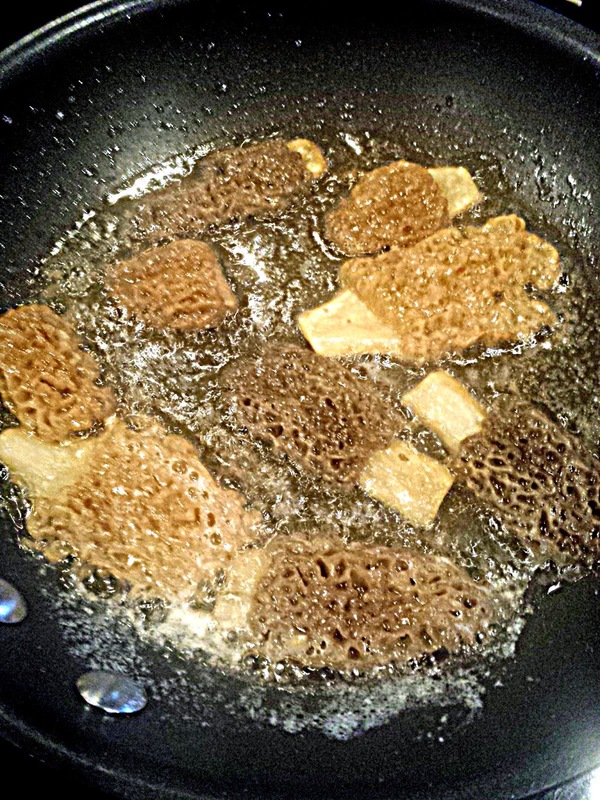 I have struggled with how to write a post on cooking with morel mushrooms. Why? First off, because I am stingy with them. They are such a treat, and they were hard for us to find this year, which makes me pull in the reigns even tighter. If the season is good, I am more liberal with them, and willing to take chances. Not the case this year. But. I did go for a walk one night. Not intending to find any morels. I was just out for the fun of looking. And I found some. I hardly ever find more than two or three on our own land. I was thrilled! But, still stingy with the mushrooms when cooking. Even though I don't have any fancy recipes for you, I will tell you what I like to do. I clean the mushrooms by soaking them in some water. 15 minutes should be sufficient. My main purpose is just to get any bugs out. After the soak, lay them on a towel for a while, and pat gently. I trim the stems of the morels to get rid of any blemished or discolored stem. Then, cut them in half lengthwise. Honestly, I LOVE them in the simplest form. Just sauteed. A couple tablespoons of butter. Or half butter, half olive oil. I do it both ways. I like them just when they are starting to crisp a little bit. You can also just give a cleaned mushroom a light toss in some flour, and then saute in butter. 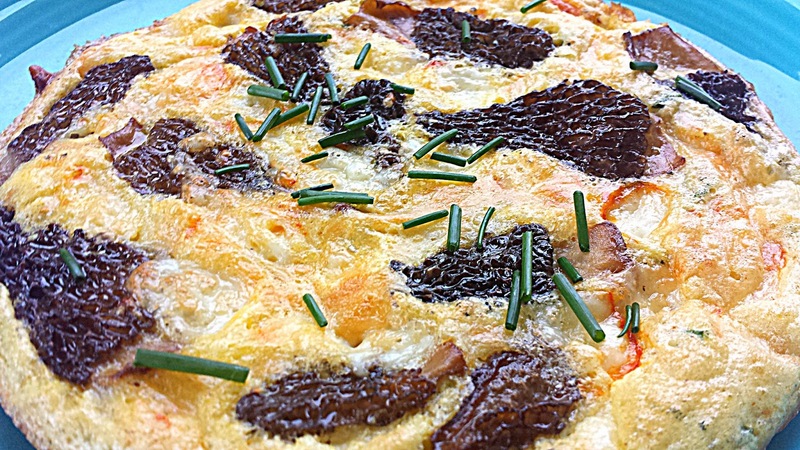 I did make an oven baked omelet this year with some morels, it was quite tasty. But, in the end, I prefer the mushrooms to be on their own so I can enjoy their flavor alone, and savor every bit of their goodness. If you would like to try some fun and delicious recipes with your morels, I highly recommend this one from Sumptuous Spoonfuls for her Morel Mushroom, Havarti & Chive Souffle. This recipe is what inspired my baked omelet. It also inspired my friend to make Morels and onion sauteed with bacon, butter and Havarti Cheese over pasta. If you try any of them, I would love to hear what you think of them. Or do you prefer them alone, to just savor every last morsel? 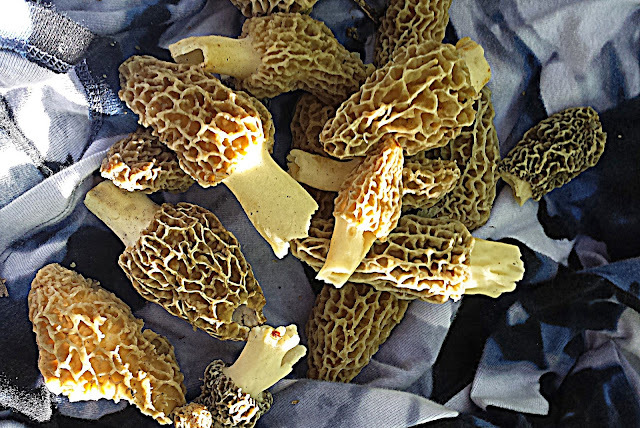 my little brother used to gather mushrooms to sell to local restaurants, and morels were always a happy find. love the omelet idea! Lucky find! They are quite pricey over here...that omelet must have tasted amazing! Oh my mouth is watering! :-) Great tips, thank you.